Anne Frank. Frank, Anne, photograph. The Library of Congress. Anne Frank is known worldwide for the diary she kept while hidden in German-occupied Amsterdam during World War II. For two years, Frank and her family remained stowed away with four other Jews in a few attic rooms above the office where her father worked. Nazi officers discovered their hiding place on August 4, 1944, captured the eight hidden Jews and sent them to concentration camps. 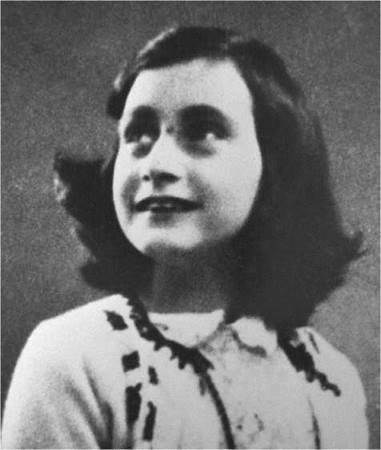 Anne Frank died in March 1945, shortly before her sixteenth birthday. Her journal, published in 1947 as Anne Frank: Diary of a Young Girl, candidly describes the experiences and emotions of an ordinary adolescent in extraordinary circumstances. Many people have found her life story inspiring and symbolic of the overwhelming tragedy known as the Holocaust. Childhood Amid Persecution and War. Annelies Marie ‘‘Anne’’ Frank was born to an upper-class Jewish family in the city of Frankfurt. The early childhood of Frank and her elder sister, Margot, was secure and loving, but the year of Anne’s birth also marked the onset of a worldwide economic depression that affected a great number of Europeans. In Germany, economic disaster, combined with the lingering effects of Germany’s defeat in World War I, led to the installation of Adolf Hitler as leader of the government in 1933. Hitler’s National Socialist (Nazi) party made anti-Semitism official state policy. Following Hitler’s decree that Jewish and non-Jewish children could not attend the same schools, the Franks left their homeland and by 1934 were settled in Amsterdam. Despite the growing threat of war, Frank lived a normal life, much like any Dutch girl, for the next few years. In many respects, Frank remained absorbed in everyday life even after the Germans invaded Holland in 1940 and imposed harsh anti-Jewish measures. Frank was forced to leave her Montessori school and attend the Jewish Lyceum. As Nazi horrors increased, including the roundup of Amsterdam’s Jews in 1941 for incarceration in concentration camps, Otto Frank and his business partners secretly prepared a hiding place in the top, back portion of their company’s combined warehouse and office building on Prinsengracht Canal. In June 1942, Anne celebrated her thirteenth birthday, receiving among her presents a small cloth-bound diary. Several weeks later, Margot Frank was notified to report to the reception center at the Westerbork concentration camp, and the family fled into the secret annex. They were joined by a Mr. and Mrs. Van Pelz (rendered as ‘‘Van Daan’’ in Anne’s diary) and their fifteen-year-old son Peter, and several months later by Albert Dussel, a middle-aged dentist. Together they remained virtually imprisoned for over two years. Anne could be headstrong, opinionated, and critical, especially of her mother. Generally cheerful and optimistic, she adored her father and attempted to get along with the others, but she was sensitive to criticism, explaining in her diary that no one criticized her more than she herself. Her special attention was given to a budding puppy love with Peter van Daan. The relationship ended soon because it was difficult to maintain in the confined space of the hiding place and because she had a talk with her father who suggested ending it. Discovery by the Nazis and Death. The diary ends on August 1, 1944, three days before the group was arrested and sent to the concentration camp at Auschwitz, Poland. Margot and Anne were later transferred to Bergen-Belsen. According to a survivor who knew her at the concentration camp, Anne never lost her courage and deep sensitivity. Both Anne and Margot died of typhoid fever at Bergen-Belsen in March 1945. Their mother had died earlier at Auschwitz. Otto Frank, liberated from Auschwitz by Russian troops in 1945, returned to Amsterdam and soon received a letter informing him of his daughters’ deaths. Miep Gies, who had helped hide the family, gave Anne’s writings to him. Urged by friends, Otto Frank published an edited version of the diary, deleting some passages he thought too personal. After Otto Frank passed away in 1980, more of the Anne Frank archive was opened, and in 1989 The Diary of Anne Frank: The Critical Edition brought readers the diary without her father’s cuts. Norman Mailer (1923-2007): American writer whose first novel, The Naked and the Dead, concerns his army service during World War II. Gunter Grass (1927-): German novelist who explored the phenomenon of Nazism. Adolf Hitler (1889-1945): German chancellor and ruler of Nazi Germany from 1933-1945. Winston Churchill (1874-1965): British prime minister during World War II. Kurt Vonnegut (1922-2007): American satirical novelist imprisoned in Germany during World War II. Night (1958), by Elie Wiesel. An autobiographical account of life in the Nazi death camps. Survival in Auschwitz (1947), by Primo Levi. The author's first-person account of daily experience in the death camp is told with restraint and dry wit, enabling the reader to grasp the horror of genocide in its full depth. Sophie's Choice (1979), by William Styron. An American writer makes friends with a Jewish man and his lover, Sophie, who gradually reveals her haunting secret. Schindler's Ark (1982), by Thomas Keneally. A novel based on the life of Oskar Schindler, a German businessman who saved more than a thousand Jews from the camps; basis for Steven Spielberg's film Schindler's List. Shoah (1985), a film directed by Claude Lanzmann. This nine-hour documentary film is an oral history of survivors, witnesses, and participants in the everyday activities of the Holocaust. Personal Narratives. Frank’s attitude toward her diary changed in the spring of 1944, when she heard the voice of a minister from the exiled Dutch government on the radio. He was proposing that letters and diaries written during the German occupation be collected, to help future generations understand what the Dutch people had endured. Frank began to copy her entire diary onto loose-leaf paper, editing and revising along the way, with awareness that it could one day be published. Anne Frank’s diary occupies a prominent place in the litany of first-person accounts of danger and hardship, including diaries from soldiers and civilians during other wars, slave narratives and captivity narratives. Indeed, for many young readers, her diary has become the defining document of this genre. Coming of Age. The Diary of Anne Frank also belongs squarely in the tradition of coming-of-age literature, fictional or factual. Frank can thus lay claim to literary precursors such as Mark Twain’s The Adventures of Huckleberry Finn and Louisa May Alcott’s Little Women. In turn, the earnestness of her self-reflection opened the way for the flourishing of coming-of-age novels in the late twentieth century, represented by authors such as J.D. Salinger for adult readers, and Judy Blume and S.E. Hinton for young readers. A Lasting Impact. Anne Frank’s diary proved remarkably popular, selling millions of copies and being translated into many languages. A stage adaptation opened in New York in 1955. Four years later, a major Hollywood motion picture was produced based on the diary. To this day, the diary is routinely assigned to schoolchildren around the world. 1. For what purposes did Anne Frank use her diary? How did the diary’s place in her life evolve over time? 2. After March of 1944, Anne Frank began writing her diary with greater consciousness that it may someday be read. How does this awareness influence her style and the direction her writing takes? Provide several specific examples supporting your main points. 3. Using your library and the Internet, research the European Jewish reaction to the rising power of Adolf Hitler. How many Jews left their homes to find safety? How many hid, as did Anne Frank and her family? Of those, how many were discovered and sent to their deaths? On the other hand, how many stayed, hoping the situation would not get worse? What do you think your family would have done? 4. The 1998 documentary film ‘‘Paper Clips,’’ depicts the story of a high school teacher in a small town in Tennessee. She wanted to open the eyes of her students to a world event that most had never heard of, and, in some way, have those students actually touch that event. The students filled a railcar with 11 million paper clips: one paper clip for each person who died. This railcar now stands as a memorial in this Tennessee schoolyard as a lesson the students will not forget. Now, imagine you are the teacher. Can you create a project that will have your students, or even your friends, connect to Anne Frank’s teen years? What could make it real to you and how would you transmit that reality to your peers? Berryman, John. The Freedom of the Poet. New York: Straus, 1976. Bettelheim, Bruno. Surviving and Other Essays. New York: Knopf, 1979. Dunaway, Philip, and Melvin Evans, eds. Treasury of the World’s Great Diaries. New York: Doubleday, 1957. Ehrenburg, Ilya. Chekhov, Stendhal, and Other Essays. New York: Knopf, 1963. Fradin, Dennis B. Remarkable Children: Twenty Who Made History. New York: Little, Brown, 1987. Giep, Mies, and Alison Leslie Gold. Anne Frank Remembered: The Story of the Woman Who Helped to Hide the Franks. New York: Simon & Schuster, 1987. Muller, Melissa. Anne Frank: The Biography. New York: Metropolitan Books, 1998. Schnabel, Ernst. Anne Frank: A Portrait in Courage. New York: Harcourt, 1958. Steenmeijer, Anna G., ed. in collaboration with Otto Frank and Henri van Praag. A Tribute to Anne Frank. New York: Doubleday, 1970.